With the steel pipes and fittings that form the backbone of the plumbing trade, you can build your own unique furniture—quickly, easily, and inexpensively. Here's how. Before you can build functional, stylish furniture for your home, you need a truckload of power tools and a craftsman’s knowledge of countless complex techniques. Right? Sure, transforming lumber into a desk or a bookcase requires experience and skill—the sort of advanced know-how you only earn through years of practice and hard work. But wood isn’t the only building material. There are many, many other options. A select few even make furniture-building all but effortless for beginners. Case in point: plumbing pipes and fittings. Normally, these hide behind walls, carrying water and/or natural gas to fixtures and appliances throughout the home. In the hands of do-it-yourselfers, however, the very same materials become the easy, inexpensive building blocks for attention-grabbing, industrial-modern furniture. The catch? Before doing anything else, you must design the piece you want to build, figure out how the pieces should fit together, and buy the parts you need. Ugh. 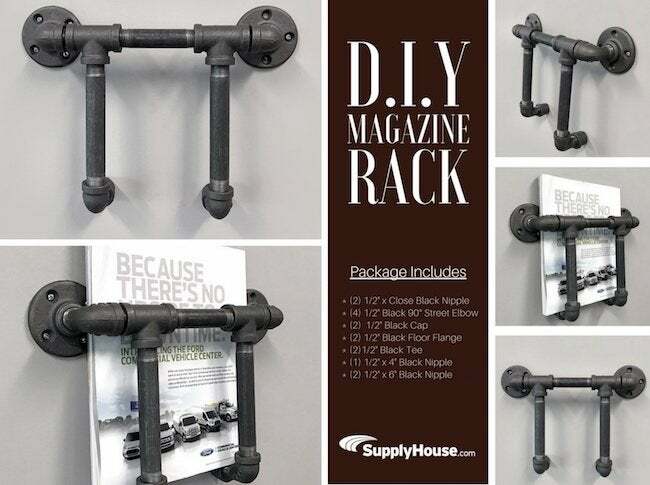 Alternatively, visit SupplyHouse.com right now and pick up the kit that comes complete with everything you need to DIY a magazine rack just like this one. No sawdust. No glue. No headaches. No surprises. Start now! This article has been brought to you by SupplyHouse.com.